Type location South Africa (Megaloponera (Hagensia) Havilandi n. sp. and n. 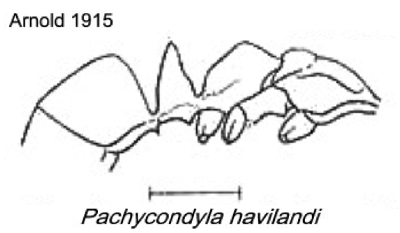 subgen., Forel, 1901f: 333, worker; Arnold, 1915: 68, male; in Pachycondyla Bolton, 1995: 305; new placement by Schmidt & Shattuck, 2014: 111) Natal, Haviland. fochi (Euponera (Hagensia) Havilandi For. v. Fochi n. v., Forel, 1918b: 155, worker) from South Africa, Durban - no images on Antweb (June 2014). godfreyi (Hagensia Havilandi For. 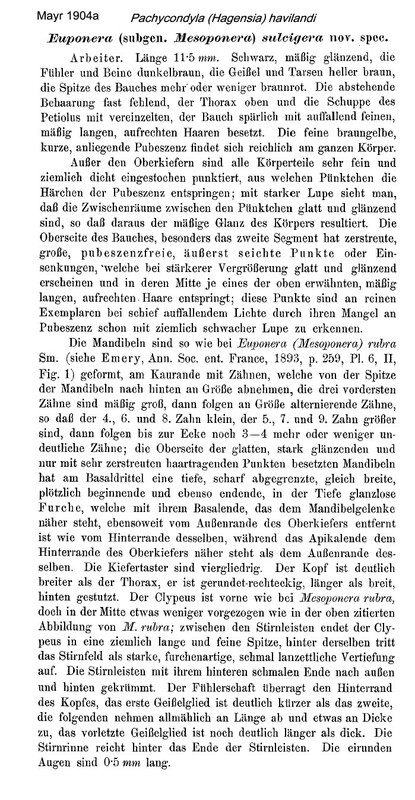 race Godfreyi n. r., Arnold, 1926: 203, worker & male) from South Africa, Pirie, King William's Town, Rev R Godfrey - no images on Antweb (June 2014). junior synonym sulcigera (Euponera (Mesoponera) sulcigera n. spec., Mayr, 1904a: 593, worker; synonymy by Arnold, 1915: 61) - no images on Antweb (June 2014). 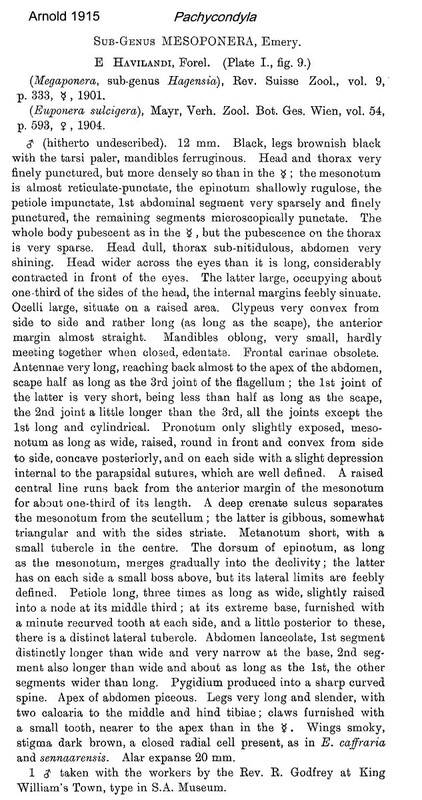 Forel's (1901f) description is at . 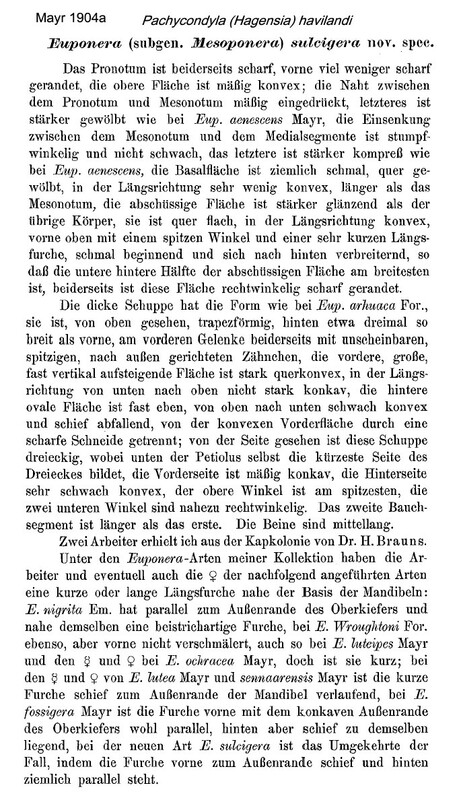 Mayr's (1904a) description of sulcigera is at and . Arnold (1915: 61) gave a translation, with the synonymy of sulcigera, this is at and . 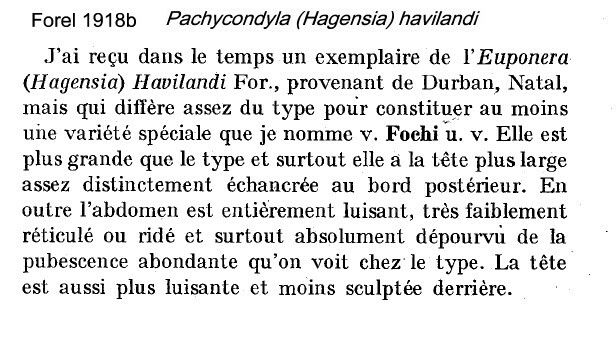 Forel's (1918b) description of fochi is at . 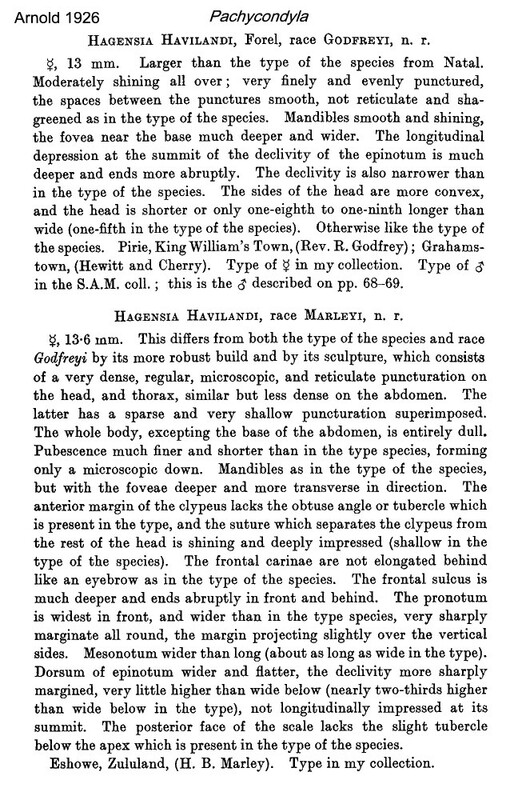 Arnold (1926) described godfreyi and marleyi at . Arnold's (1951) revisionary study is at . 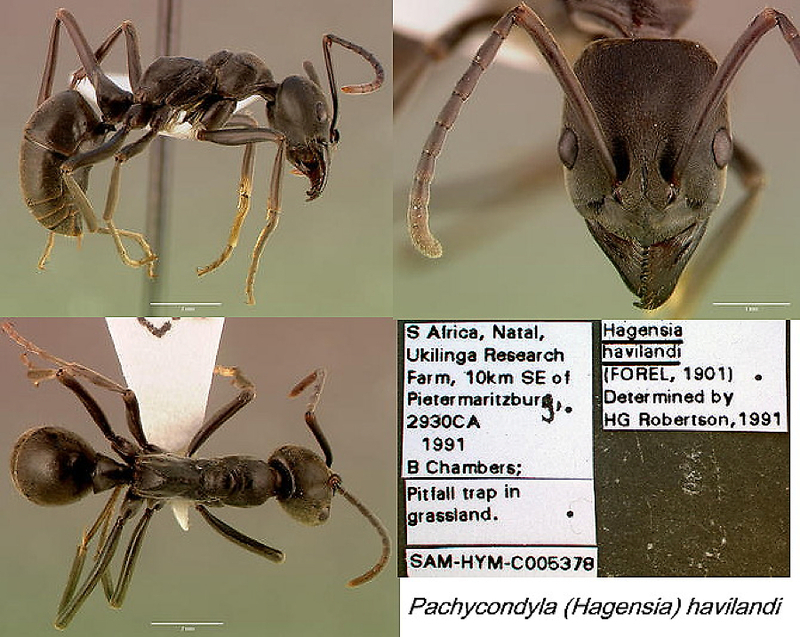 Specimens of marleyi can be seen on the Antweb.org site at http://www.antweb.org/specimen.do?name=sam-hym-c001445a and (a male) http://www.antweb.org/specimen.do?name=sam-hym-c001445b both from South Africa: Natal: Mkuze Game Reserve; 27�'00"S 032�'00"E; Collection codes: SAM-HYM-C001445; Date: Collected by: C.Peeters. The main obvious difference from the type is the heavier build, as drawn by Arnold and a greater amount of fine pubescence.